Swings and Things is your online store for hammocks, hammock chairs, hammock accessories, and garden art from around the world. See our large selection of high quality and unusual items, all of which can be shipped direct to you anywhere in the USA. 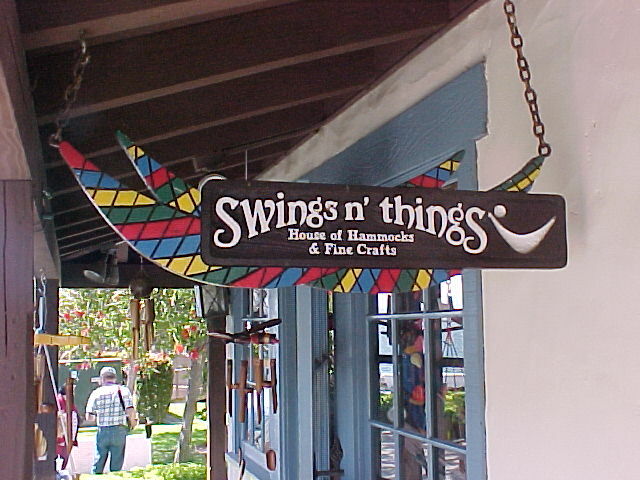 I visit San Diego every year, and upon my visit to Seaport Village I encountered your store, Swings And Things. The first thing I noticed was the fun, playful atmosphere that your employee created. The next thing Inoticed was your employee, herself. I had never been to your store before, and I found it very hard to leave. Lindsay brought a real smile to my face. She really knew how to lighten the mood. I could tell she managed your store well when it got a little busy… But that seems normal for Swings And Things – who wouldn’t want to hang out in hammocks all day! Lindsay sold me a very large hammock called the Maya 40. I love my new “bed”. It hangs in my room and i find it hard to get out of! Thank you for your wonderful addition to my place. Lindsay is a great team member of yours! I look forward to visiting swings and things upon my next visit to San Diego, and hopefully I’ll see Lindsay again, as well.